There are countless benefits to owning a conservatory. As more people are expanding their living space rather than moving home, it can provide an elegant addition, be it as a family room, play room, music room or to host a stylish dinner party to impress your friends. Whatever your style, whatever your space there’s a conservatory design for you giving you the perfect way to add a new dimension and value to your home. 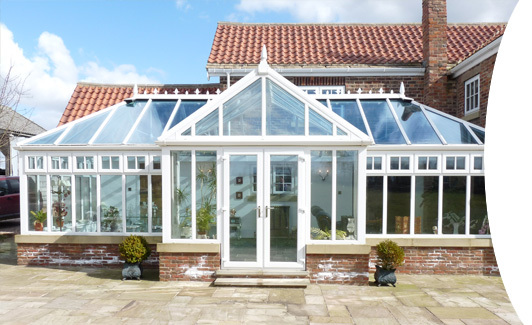 The Victorian is a very popular style of conservatory with a versatility that makes it suitable for many house styles. the Lean-to style is the perfect choice. PVCu makes your conservatory virtually maintenance free and with finishes including white, woodgrain, golden oak, Irish oak, cream, green or even a combination of “coloured” exterior with white interior there is something for everyone. The very latest material & design innovations also ensures that it retains heat during the winter months and can remain pleasantly cool at the height of summer.